"Ultimately, if I never win anything, I can live with that. But I believe I have to be bold." - Ryan Hall in a profile by Amby Burfoot. Is it OK to wear School Singlet in a Road Race if you're an ALUM? Is Doug Logan getting it done as the head of USATF? *Robert K. Cheruiyot And Kenyan Quartet Set To Rock Frankfurt Pat Butcher gives an excellent report from Frankfurt. *Quotes From Frankfurt Marathon Press Conference Cheruiyot's coach, who had him run 160 mile weeks in training, is still shy of his 40th birthday and will be competing along with his speedier charge. *15 Guys With Sub-2:09 PRs Will Contest Commerzbank Frankfurt Marathon Last year, the "other" Robert K. Cheruiyot won his marathon debut in Frankfurt in a course record 2:07:21. For the list of top men in Frankfurt, click here. Italy: Venice Marathon Is Sunday *JapanRunningNews is on site in Venice for coverage. "The People's Marathon": Marine Corps Marathon The 34th running of a "LetsRun.com favorite" will be Saturday Sunday in the Arlington and D.C. area. All previous winners listed here. Runners as famous as Kenny Moore and Weldon Johnson have run and won Marine Corps. The last man to break 2:20 at MC is Darrell General in 1997. Boston: Mayor's Cup Franklin Park Sunday's men's 8k and women's 5k just outside Boston is one of the best and fastest US open cross-country meets. Race Schedule Press Release. Oregon: Inaugural Strands 5k This Saturday In Corvallis Jonathon Riley and Elva Dryer headline solid fields. 9am Pacific start time. France: Rwanda's Top Man Disi Headlines 20.3k In Marseilles Disi just won a half marathon 7 days ago. Gotta pay them bills, so he's back on the streets again. Canada: Niagara Falls International Marathon & Half Employee #1 runs his first half marathon and then hopes to take a ride over the falls in a barrel. Breakthrough: LetsRun.com Reader Figures Out Median/Mean 5k Times For LRC Message Board Visitors The readers of LetsRun.com never cease to amaze us. Today one devoted reader took a break from his job in data analysis to analyze data on our World Famous Message Boards. Based on evidence from the recent thread My 5K PR is 15:45. Am I the median for Letsrun?, he discovered that in fact 15:45 is pretty close to the median. See where your 5k PR lies on the "LRC 5k Bell Curve." US Women Ranked Best Mid-Distance In The World Congrats to Anna Willard, Shannon Rowbury, Christin Wurth-Thomas, Jenny Barringer, Maggie Vessey and co. as the ranking system developed by All-Athletics.com showed them as #1. The men ... they sit at #2 behind Kenya. China Opens "National Games" With Another Huge Celebration A 19-year-old won the 10,000m on the track to open the 11th edition of the Games. To the left is a picture of the one year anniversary celebration of the Olympics with 33,000 Chinese practicing Tai Chi outside the Bird's Nest. IAAF Head Cancels South Africa Trip And Hopes For Meeting On Neutral Ground Hopes to diffuse the Caster Semenya vitriol took a hit with this news. The vibe in SA towards the IAAF is so venomous that even the diplomatic Lamine Diack cancelled his visit. According to news reports, not only are the IAAF going to be sued by Semenya's lawyers, but various governing bodies from ASA to the ruling political leaders in South Africa have called for all IAAF test results to be null and void. Best Read In The Industry: LRC's Week That Was Last week was a little light in terms of big events, so we highlight the efforts to save the Millrose Games, tell you how the LetsRun.com audience is the smartest on the planet, talk about Pre-NCAAs and give out lots of free training advice. Bolt Bowls Cricket Star - Like LeBron James Striking Out A-Rod? Usain Bolt played a charity cricket match and the verdict is that he is actually a remarkably good cricket player. Article On Barefoot Running - Dallas Morning News Thanks to the NY Times Bestseller Born To Run by Christopher McDougall, many eager runners are trying barefoot or "natural" running. New Book: "Something In The Air" By Richard Hoffer - 1968 Mexico City Olympic Games And American Defiance Mixed review from LA Times. Kenya Wanjiru Will Face Zersenay Tadese And Patrick Makau In Stellar Jan 7 Half In Abu Dhabi $300,000 will be on the line for half marathon aces. Yokota Breaks Japanese 15-Year-Old National 800m Record In 1:46.16 The Japanese have great marathoners and some great 100m runners, so how is their mid-distance so relatively slow? Ross Tucker, aka The Sports Scientist, Talks About Fatigue And The Brain You have to be in a "sciency" mood for this writing and video, but Tucker is on the forefront of scientific study of things like pacing that are very important to distance runners. Profile Of Ryan Hall One Week Out From New York City 762 out of 1,000 LetsRun.com voters think Ryan Hall will be the first American in New York, while Olympic marathon medalist Meb K., who has set PRs at the full and 1/2 marathon this year, gets only 12% of the vote. Amby Burfoot attempts to put Hall in perspective for the Runner's World audience by comparing him to guys like Bill Rodgers while pointing out Hall has never won a major marathon. *Tens Of Thousands Queue Up To See Their Hero Liu! *Legend Julio Rey (2:06:52) Retires W/ Spanish Marathon Record Rey was busted in 1999 and suspended 2 years for illegal drugs. Brief Chat With Magdalena Lewy Boulet Boulet is ready for New York. NYTimes: Do Plodders Have A Place In The Marathon? Coach Adrienne Wald certainly could do without the joggers: "It used to be that running a marathon was worth something - there used to be a pride saying that you ran a marathon, but not anymore. Now it's, 'How low is the bar?'" *BizRunner Digests Above And Suggests A Fee For Those Below The Oprah Line If you run slower than Oprah, you have to pay more for the streets to stay open for you. Recommended Read: Essay On Crop Shortages In Ethiopia Causing Hunger and Food Shortages For Runners, Families Very interesting article. *LetsRun.com NCAA Polls Are Open Again For Voting Get your votes in before the weekend. We hope to release them along with some conference previews next week. Recommended Read: Sudden Death During Exercise: The Media, Risk And Running Ross Tucker at Science Of Sport writes a GREAT piece on the mainstream media's coverage of the sudden deaths of 3 runners at the Detroit Marathon this weekend. Brief Chat With Brian Sell - A Career About To End In NY It's not every day you read an interview with a runner whose fairy tale career is about to end. Olympian Sell: "Peachtree (on July 4) was very, very bad. It was very competitive this year overall and it was the U.S. (10K Championship), and I don't think I even cracked the top 15 U.S. Yeah, it was a pretty bad race for me." More quotes from a beat-down Sell inside. Buster's Back! Craig Mottram To Return At Chiba Ekiden He returns to find more company in the "White Guy Who Can Break 13:00 For 5,000m Club." Sally McClellan To Try Heptathlon McClellan is a super athlete in the hurdles. NCAA And Direct Athletics Announce New Standardized Meet Result Database This is going to be one of those things where everyone says, "I can't imagine what life was like before this." Finding college meet results is such a pain, this database should make finding results so much easier. ESPN Article Of The Day: U Of Minnesota Issues Apology Because Goldy Gopher Made Fun Of Praying Penn State Player We thought we were reading a joke from Prairie Home Companion. The heinous mascot humor was caught on video here. IAAF Needs A Title Sponsor For 13-Meet Diamond League In 2010 Zales? The Golden League is gone and now we're on to the Diamond League, which means two meets in the United States (Pre and Reebok NYC). Robert Cheruiyot Hopes To Erase Injury Doubts With Big New York Performance Cheruiyot has converted to Islam and his Muslim name is Omar Ahmed. Can the 4-time Chicago champion get back on the top of a world marathon major after injury troubles? It's going to take one hell of an effort against this tough field. Brief Chat With Meb Keflezighi Meb is back to 100% and has run PRs at the marathon and half-marathon distance this year. *ING NYC Men's Field With Bios Here It's hard to focus solely on Ryan Hall winning, as there's a decent chance he won't even be the top American in the race with Meb, Abdi, Bolota Asmerom and others in there. Recommended Read: NY Times Article On George Hirsch Hirsch may not be among the race elites but he is certainly one of the elite figures in New York City distance running as chairman of NYRR. He'll be flanked by friends German Silva and Bill Rodgers in an attempt to finish his final marathon, the one he helped bring to all five boroughs in 1976. *London Olympic Chiefs Getting Roasted For "Banker-Size" Salaries And Bonuses Some officials are taking in a quarter million a year plus big bonuses for what amounts to their part-time job (2-3 days per week). *Size Of Team GB Track Team May Shrink - Depends On Raising Funds And the UK supporters wonder why there aren't many athletes lining up for this profession. Iowa Simon Sawe Wins Des Moines Marathon After Passing Train Turns Marathon Into A 400m Sprint The second place runner caught him during the train crossing, so Sawe had to outkick him after waiting a minute for the train to pass. 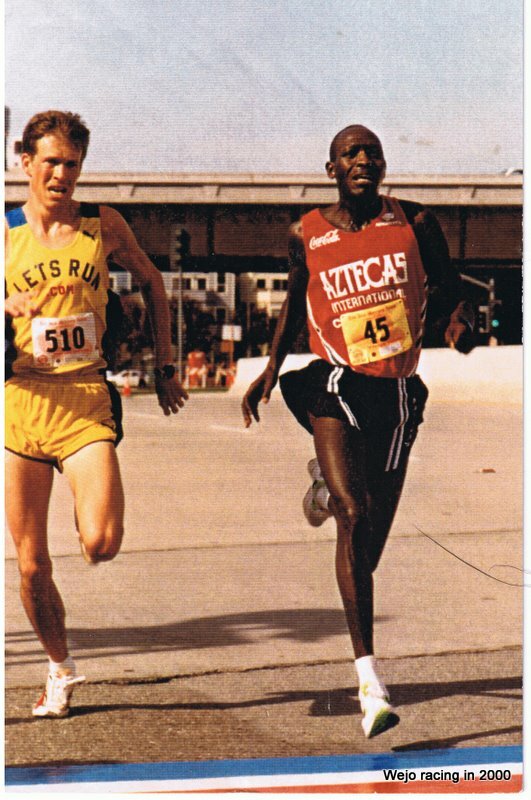 We know all about Sawe's closing speed as he outkicked LRC co-founder Wejo in 2000 (see photo) and his advice after the race helped Wejo lower his 10k PR by over a minute in his next race. *Great Gesture: Joe Shay Offers Support To Families Of 3 Men Who Died During Detroit Marathon Joe is the father of US star Ryan Shay, who died unexpectedly during the 2008 Olympic Marathon Trials. Providence Super Talent Kim Smith - NZ Half Marathon Record Holder - Making Permanent Shift To Marathon Providence RI's Kim Smith lowered the Kiwi half record by a minute in Birmingham. She targets April's London Marathon as her first big marathon performance. Erin Moeller Signs 4-Year Deal With Mizuno Moeller was tenth at the 2008 Olympic Marathon Trials.